It is a common misconception that you need to have a large pond or lake in your yard if you want to keep ducks. Lucky for us suburban farmers, that is just not true! Backyard ducks will be happy with a small wading pool. When space is a concern and you don’t have the luxury of a huge body of water in your yard, picking the right breed is important. There are lots of breeds of domesticated ducks, these ducks have been breed for years to be raised by humans on traditional farms, backyards or even as indoor pets! Click here to read about different duck breeds. Some of the most popular domestic breeds include: Buff, Cayuga, Pekin, Indian Runner, Rouen, Welsh Harlequin, Swedish, Muscovy, White Crested, Khaki Campbell & Call Ducks. Unlike their wild ornamental relatives who spent most of their lives on the water, domestic ducks only spend about 10% of their day in the water. They are happy to forage in the woods, nest in the bushes and spend their day searching for slugs in the garden. Another benefit of domesticated duck breeds is they are bred to be very poor flyers, so you don’t have to worry about them taking off. Domesticated ducks might not NEED a pond, but they would LOVE a little pool for splashing! Before you get out the shovel to start digging, dial it back a bit. Ducks love splishing and splashing, but they don’t need an Olympic size pool. They will be happy with a small kiddie pool or stock tank. With a large pond, cleaning can be a hassle, but a small kiddie pool is easy to dump and refill every day or so. The only requirement ducks have is water deep enough for them to submerge their whole head. They need to keep their mucous membranes moist so having clean water available at all times is really important. We have tried several pool configurations in our years of keeping backyard ducks. 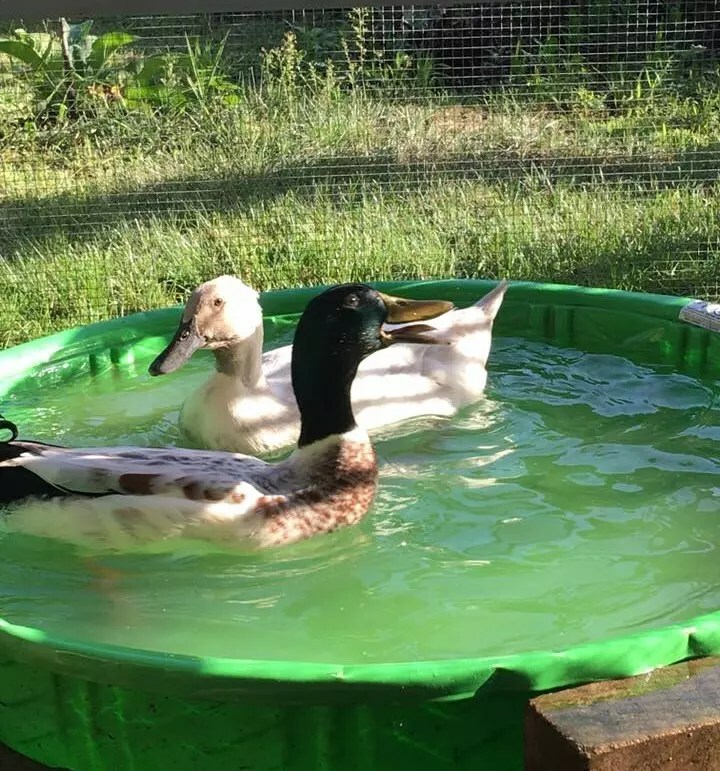 At first, when we had just two ducks, we bought a very small kiddie pool. This is a great little pool, about 3 feet across and about 5 inches deep and holds maybe 20 gallons of water. 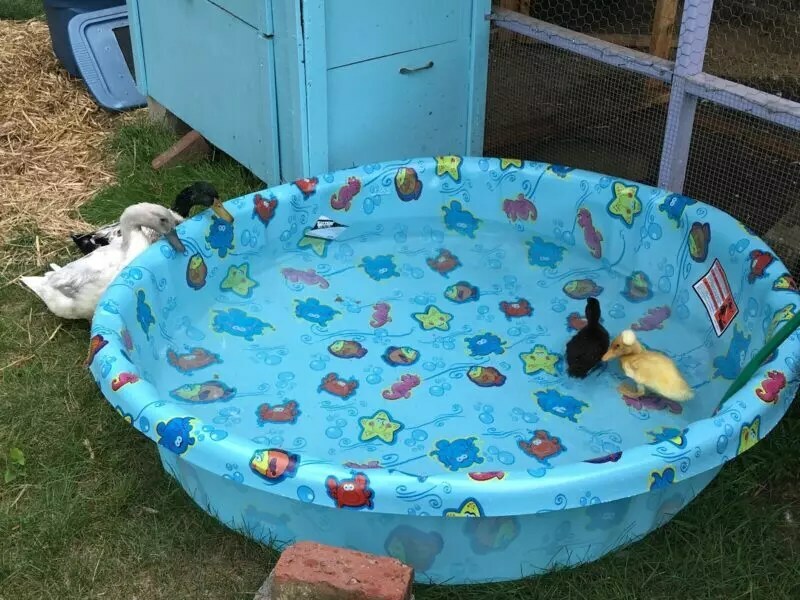 It’s good for little ducklings or a pair of ducks (although I still use this pool sometimes and all four ducks will hop in and have a grand time). I love that it is super easy to tip over and empty, which means I can easily & quickly clean it. The downside is it needs to be dumped every day in the summer, or every other day in the spring/fall. As the two ducks grew, we realized they really wanted to dive and swim underwater (which is really hard in just a few inches of water). We found a 150 gallon stock tank on a yard sale site for cheap so we snapped that up. This pool has been more hassle than it’s worth. Things I like about it are that it is super deep (the ducks LOVED diving in it!) and that it has a drain plug in the bottom for emptying. The things I hate are numerous – because it is deep, that means it’s really tall so a ramp of some kind needs to be made to get the ducks into the pool. We tried many things and never really found a good solution. You could bury it to make it level with the ground, but then you can’t access the drain and it would be impossible to clean without buying pond equipment. It was really deep, but the surface area was so small, even with only two ducks, they looked cramped. But what I hated most was all the water waste – 150 gallons is A LOT of water, we didn’t have a good place for it to drain, and it killed me to waste that much water every few days. Besides the waste, the time involved in waiting for it to drain and then filling it back up was just insane compared to the 5 minutes it took to clean the little kiddie pool. We only filled this tank up a couple times before giving up on it. Want even more ducky inspiration? These are some of my favorite duck ponds from around the web! 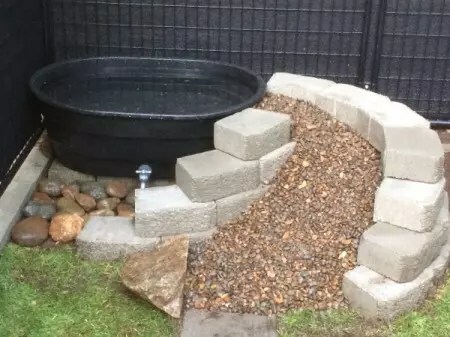 This is a great idea I saw on BackyardChickens.com, the waterfall feature not only looks pretty, it keeps the water circulating to keep it cleaner and keeps mosquitos from gathering. 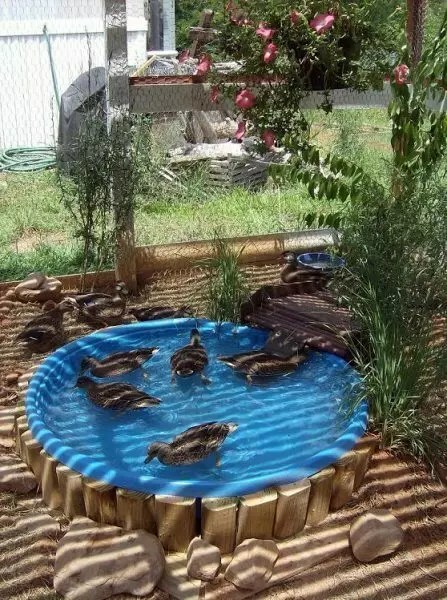 Look at this cute duck pool & sundeck from FarmYourBackyard! I’d love to hear about your duck set up! 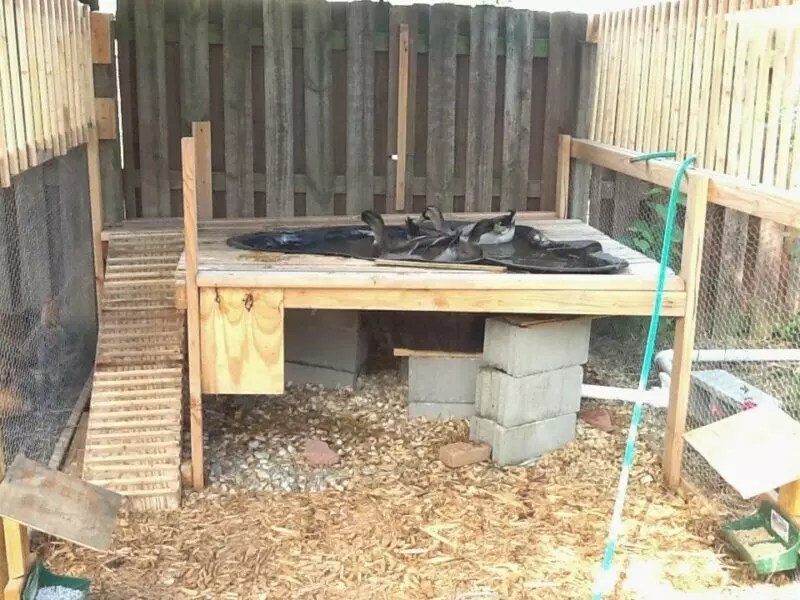 This entry was posted in Ducks and tagged diy duck pond, do ducks need pond, duck pond. I have run into the same problem with my ducks. I have 3 jumbo Pekin and they love the pool, but make a mess. I hate dumping all the water every day. So I have started working on a filtering system to remove the majority of the nasty water and pump it into a container garden and that clears the water and then returns the cleaned water to the pond. I don’t have it perfected yet. Plus with the snow it is on hold till spring. It’s an amusement, Ponds are terribly fabulous addition however if maintained properly. Pond coating has made it simple. It gives excellent protection from leaks and hurt. I have a friend that insists that when she was raised on the farm that the ducklings had to be taught to swim by the Mother. She found sever drowned in a ditch. I had an understanding that ducks were born with instinct to swim. My ducks all arrived to me when they were 1 day old so no mother duck taught them to swim. The issue is that for about the first month of life ducklings aren’t producing enough oil in their preen gland (a small gland at the base of their tail) and aren’t good enough at distributing what they are producing. The oil keeps them naturally buoyant and their feathers waterproof. When ducklings are with their mother she is helping to preen them and actually using some of her oils on her ducklings so they can go for a swim after a couple days. So when you are raising ducklings without their mother you should just keep an eye on their swimming the first few weeks – don’t let them go in really deep water and don’t let them swim for too long. After about a month you should see them preening themselves often and their fluff should be getting replaced by feathers and they are good to go – no swimming lessons required! Awesome Post!! I appreciate your great ideas about backyard pond. Thanks for sharing your thoughts. In July 2018 we ordered and received 26 ducklings. I kept them in our bathtubs and x-large totes for 2-3 weeks. We then put them in a brooder for another 2 weeks. Our problem is these ducks won’t go in our man-made pond. 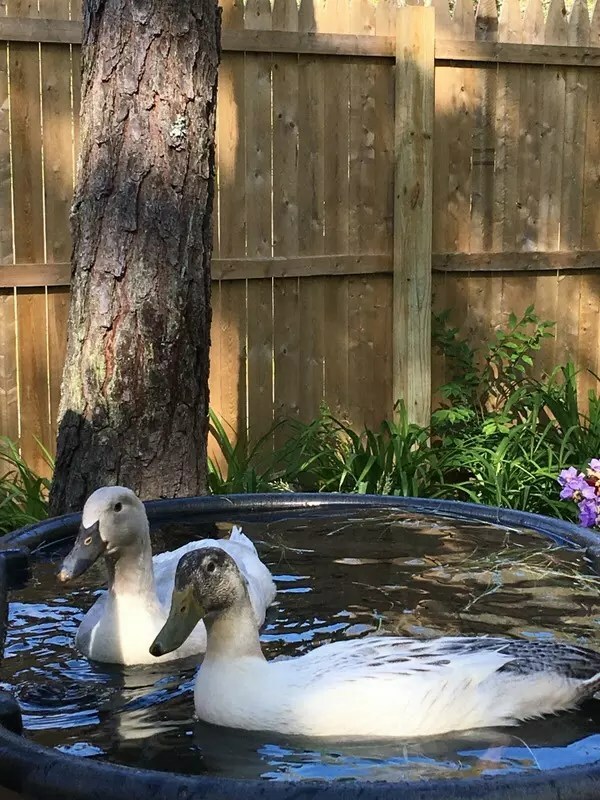 They will go in the baby pool as long as it is not near the pond. What could possibly be going on with them? hmmm that is strange! So they aren’t quite full grown yet correct? Is there any cover around the pond? It could be possible they are a little leary of it because it is too big and out in the open. I bet once they are full grown (usually around 4 months) they will love it, but to encourage them to go down there, you could try planting some low bushes or shrubs around the shoreline where they could retreat to if predators are flying overhead. 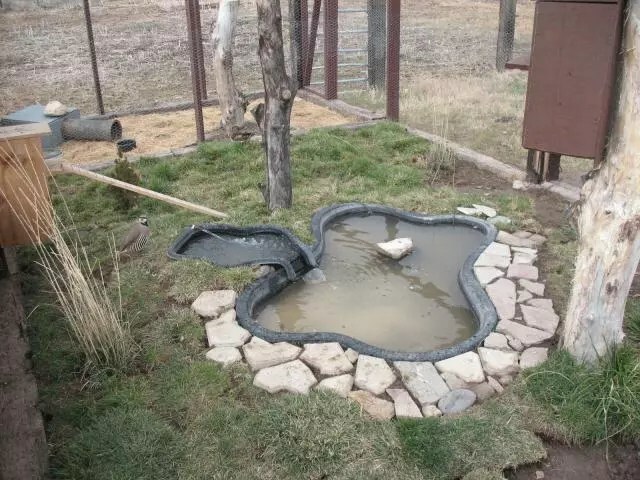 I have also seen some duck keepers with ponds build floating duck houses for in the water (google image search floating duck house to get some ideas). Good luck!